Swan Er Hong, a notable performance artist native to Mercury, has her life abruptly changed by the death of her grandmother, Alex. As Swan is asked to investigate the project her grandmother was working on, her home city is subjected to a brutal terrorist attack. This sparks a series of journeys back and forth across the Solar system, from Mercury to terraformed Venus to drowned Earth and out as far as Io and Titan, as Swan and her allies attempt to discover the threat nature of the threat to humanity. 2312 is Kim Stanley Robinson's first widescreen, big-budget, blockbuster SF novel in some considerable time. His recent novels (such as the recent Galileo's Dream or his near-future Science in the Capital trilogy) have been modest in their ambitions, but 2312 trots out the same Robinson who charted the colonisation of Mars in such fascinating, exacting and sometimes-frustrating detail over the course of three books in the 1990s. The novel works on several levels. On one, it paints a portrait of life in the early 24th Century where the bulk of humanity lives on Earth (and, increasingly, Mars) but the 'spacers' who have settled the rest of the Solar system hold increasing amounts of power, despite their small numbers. This portrait is vivid, rich and compelling. It shows Robinson's imagination at its most fertile, as he depicts Terminator, a city which rolls over Mercury's surface, permanently trying to stay on the nightside of the planet out of the fierce rays of the nearby Sun. Elsewhere he shows the terraforming of Venus as its thick atmosphere is stripped away and politicians debate on slamming giant asteroids into it to increase its rotation. Another section takes us to Greenland, where a huge damming project is underway stop one of the Earth's last few glaciers from melting into the sea. On Io people have to live in settlements which act as gigantic Faraday cages (to hold the immense radiation of Jupiter at bay), whilst in orbit around Saturn people go surfing on plumes of ice pulled out of the rings by the passage of the shepherding moonlets. As a grand tour of the Solar system, 2312 is constantly inventive and fascinating. On the second level, the book is striving for literary credibility. Robinson has always been one of the finest writers of prose in hard SF (not, it has to be said, a densely-populated field), and that continues here. He may be fascinated by science, by technology and by visions of the future, but he's much more fascinated by people, as individuals and as collective societies, and how they operate. As such the characters are richly-defined and textured, showing surprising depths as the novel develops. The prose is also finely-weaved but Robinson's long-standing tendency to interrupt it with infodumps remains an issue, although much less so than in his Mars Trilogy. Most notably, Robinson's writing keeps two potentially dull sections (one featuring characters having to hike along a thousand mile-long tunnel, the other featuring a character adrift in space) from flatlining and in fact elevates them to two of the strongest sections in the book. The third level, the actual plot, is where the novel hits the most bumps. In the Mars Trilogy Robinson portrayed a vision of the future where the characters had to deal with scientific hazards and the simple realities of day-to-day life in a hostile environment. Whilst there were antagonists, these were shown to be part of the naturally-arising problems of colonisation and the eventual need for independence. In 2312, however, Robinson has a much more overt and traditional thriller storyline in which mysteries need to be investigated and explored and a resolution reached. To put it mildly, this plot feels half-arsed at best and the novel improves dramatically when Robinson completely drops it for much of its middle third, instead focusing on his grand vision of humanity's possible future. 2312 (****½) is a credible and somewhat optimistic vision of our future, highly detailed and constantly inventive. Coupled with some rich characters and enjoyable prose, this makes for his finest novel in many years. However, some contrived plot twists and a dull thriller element weaken the narrative a little. The novel will be published in the UK and USA on 24 May. 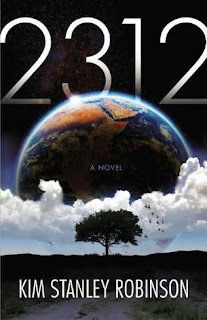 NOTE: The first half or so of the novel strongly indicates that 2312 is set in the same continuity as the Mars Trilogy. However, a detailed timeline given later in the book reveals this is not the case and the two works are separate, although 2312 does borrow a few names and terms from the older work. Really looking forward to this one. Somewhat disappointed that it's not a direct sequel to the Mars Trilogy but it sounds more or less what I was hoping he would write after Blue Mars. It's been a long wait. You can only ever have one first internet search - and mine was for Kim Stanley Robinson. That was how impacting the Mars books were on my life back in the 90s. Out of habit, I still like to see what he's up to, but his work since then has been mildy engaging at best. If this is that much hoped for return to form then the rest of my life can go and take a lie down for a few days!